Google Groups stopped me from posting a stupid redundant question this morning. 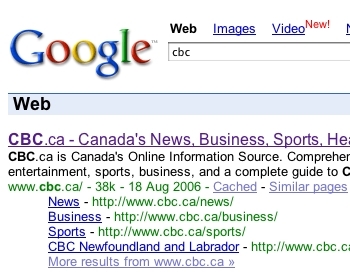 Notice how there are multiple links to additional sections of the CBC web site? This is what I want to understand. At first I thought it might be controlled by Google Sitemaps but I couldn’t find anything within the site maps protocol that would allow controlling something like this. So then I turned to Google to see if it could return any other sites that might have information on how to do this. That didn’t work so well as I couldn’t figure out the right set of terms to search for. What the heck do you call those extra links? How do you search for “google search results” and get something, well, meaningful? Finally I turned to the Google Sitemaps help which lead me to the Google Webmaster group. As I browsed through a bunch of posts, I decided I should just post my question. As I was typing up my post, I noticed the section on the right hand side of the page with the title “Have you looked at these messages?”. Well holy crap! No, I hadn’t looked at those messages and sure enough, they gave me the answer I was looking for. Google Groups stopped me from posting a redundant message. Hot damn, why can’t all forum code do this? I remember back in my USENET days that a common response to many a post was “did you search before posting?”. This simple little box of context sensitive possibly related topics is fabulous. Maybe some day Google will release the Groups tool so the rest of us can make use of it. Something like that would be super handy for most forums where people are asking similar questions. Especially support forums for software applications. Even more useful would be if instead of sponsored links, Google could add in the same context sensitive related messages. Then you could quickly flip between threads that the Google algorithms determined to be related. Oh, and as for those link, they are called SiteLinks according to this thread and they are automagically generated by Google. This wasn’t exactly the answer I was looking for but now I know I can’t do anything about it so I’ll find something else to waste my time on. Maybe some day Google will show we peons how to generate such links but for now, we just need to say “That’s cool.” and continue on our merry way. This entry was posted in Site Info, Technology and tagged context sensitive, Google, groups, site maps, sitelinks on 2006/08/20 by Jeff Ivany.